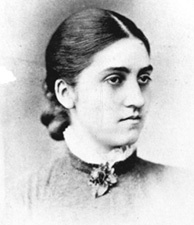 JOHNSON, THERESA MARY (Gowanlock), pioneer and author; b. probably 29 July 1863 in Tintern (Lincoln), Upper Canada, daughter of Henry Johnson and Martha A. Upper; m. 1 Oct. 1884 John Alexander Gowanlock in Tintern; d. there 12 Sept. 1899. Theresa Mary Johnson left the quiet security of her Loyalist family’s home on the Niagara peninsula for the North-West Territories following her marriage in 1884 to 24-year-old John Alexander Gowanlock, who had secured a government contract to build a combined saw- and grist-mill at Frog Lake (Alta). The new Mrs Gowanlock enjoyed the journey west and showed an intelligent interest in the people of the NWT. After a six-week stopover in Battleford (Sask. ), where John Gowanlock had been managing a store earlier that year, the couple continued on to Frog Lake, arriving on 12 December. The community at Frog Lake consisted of a Wood Cree Indian reserve (Unipouheos Indian Reserve, Alta), and a small white settlement that included a Hudson’s Bay Company post, the Roman Catholic mission of Father Léon-Adélard Fafard*, and an Indian sub-agency. The three bands of Wood Crees on the reserve had been joined by the Plains Cree band of Big Bear [Mistahimaskwa*] for the winter of 1884–85. The Gowanlocks spent the first two months of 1885 on the construction of the sawmill, and by mid March all was completed. The winter, however, had been a restless one among the neighbouring Indians. Métis agitators and rumours of rebellion exacerbated the situation, and news of the Métis victory over a force of North-West Mounted Police at Duck Lake (Sask.) 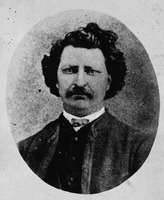 on 26 March [see Louis Riel*] brought events to a head. On 2 April the Plains Cree war chief Wandering Spirit [Kapapamahchakwew*] and Big Bear’s son Āyimisīs (Little Bad Man) led an armed group into the settlement, herded the whites together, and ordered them to go to Big Bear’s camp. Indian agent Thomas Trueman Quinn resisted and was shot by Wandering Spirit. That shot touched off a fusillade as the Indians fired on the unarmed settlers. Within moments nine of the ten white men of the settlement lay dead; HBC clerk William Bleasdell Cameron* was saved by friends among the Wood Crees. The two white women, Theresa Gowanlock and Theresa Delaney, were pulled from the corpses of their husbands and taken to the Indian camp where, protected by mixed-bloods living with the Crees, they spent two months in captivity. For the two women these months were a nightmare of unaccustomed physical and mental hardship. They were not molested, and were fed and housed as well as their captors, but they were not prepared for the rigours of Indian life. Although the initial shock of the massacre abated, the sight of the “murderers” wearing their husbands’ clothing continually reminded the widows of their grief. They understood little of the Crees’ language and less of their customs, and lived in constant fear that something might reignite the passions of Big Bear’s warriors and cause them to kill again. 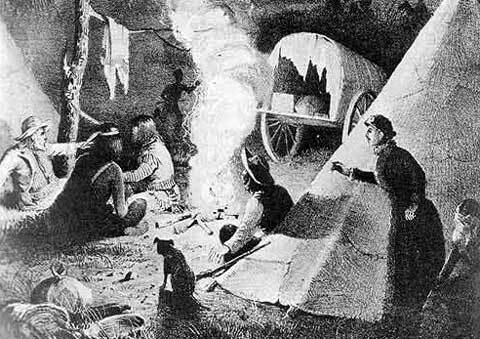 The women moved with the camp until 31 May, when with the mixed-blood families they slipped away as the Indian band hastily broke camp before the pursuing Alberta Field Force led by Major-General Thomas Bland Strange*. On 3 June scouts from Strange’s force came upon the mixed-bloods and rescued the two white women. Gowanlock then returned to her parents’ home in Tintern. She never regained the health and youthful enthusiasm with which she had embarked for the North-West Territories, and she died quietly 14 years later. Gowanlock’s account of the events at Frog Lake, together with a shorter one by Delaney, was published soon after her return to Ontario by her husband’s family. This narrative of his death and her own captivity is remarkable for its generally calm tone and for its perspicacity, despite the occasional and understandable outbursts of grief. She describes life and work in the camp in a clear and conversational style and, although she may have lacked the grasp of events of others who later wrote of the incident, such as Cameron, her observations are interesting as a firsthand account of this episode in the North-West rebellion. Ont., Office of the Registrar General (Toronto), Deaths, registration no.1899-05-015575. St Catharines Public Library, Special Coll. (St Catharines, Ont. ), Cemetery records, St Ann’s United Churchyard, Gainsborough Township, Lincoln County, transcript of tombstone inscriptions. Univ. of Sask. Library (Saskatoon), Morton ms coll., mss C550/2/5.1, Edward Ahenakew, “The Frog Lake massacre.” The Frog Lake “massacre” : personal perspectives on ethnic conflict, ed. Stuart Hughes (Toronto, 1976). T. [M. Johnson] Gowanlock and Theresa Delaney, Two months in the camp of Big Bear: the life and adventures of Theresa Gowanlock and Theresa Delaney (Parkdale, Ont., 1885). Globe, 10 April, 8, 23, 29 June 1885; 14 Sept. 1899. Saskatchewan Herald, 23 April, 1, 8 June 1885; 27 Sept. 1899. R. C. Laurie, Reminiscences of early days in Battleford and with Middleton’s column . . . (Battleford, Sask., 1935). W. B. Cameron, Blood red the sun (rev. ed., Calgary, 1950). S. A. Martin, “JOHNSON, THERESA MARY,” in Dictionary of Canadian Biography, vol. 12, University of Toronto/Université Laval, 2003–, accessed April 18, 2019, http://www.biographi.ca/en/bio/johnson_theresa_mary_12E.html.